Design caricature logo inspired by my dog for pet care business. 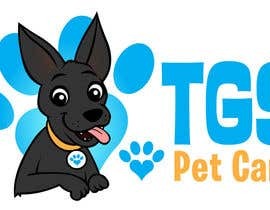 Design caricature (cartoon) logo inspired by my dog (attached) for pet care business. I have attached my current logo which should be reworked and incorporated in my caricature logo design..... I want the entire logo to have a cartoon - fun hearted feel. The final files must be delivered in vertical and horizontal versions. As well as solid black versions. We would also need all the common files jpg, png, etc. We would also need the source and vector files and all fonts used.